Exporters from Malaysia, the world’s largest producer and exporter of Halal food products, are going to showcase its multi-billion dollar Halal industry that last year recorded US$9.79 billion (RM42 billion) worth of Halal exports worldwide – at the 9th edition of the Halal Expo Dubai to be held from September 18-19 at the Roda Al Bustan Hotel near Dubai International Airport. Malaysia is a global leader in Halal food products as well as a hub for Islamic finance. Malaysia will be represented by 15 strong ready to export entrepreneurs that will sit under the Malaysia’s national pavilion at the Halal Expo Dubai that will widen the choice of Halal products for local importers and consumers in the UAE and the Gulf. Malaysia’s Ministry of Agriculture and Agro-based Industries is leading the country’s participation at the Halal Expo Dubai – the only such exhibition in the UAE. The participants represent Halal food, cosmetics and pharmaceuticals sectors. Globally, Muslim expenditure on food and beverage (F&B) was estimated at US$1.12 billion in 2014 and potentially rising to US$1.58 billion in 2020. Muslim expenditure makes up 16.7 per cent of global expenditure on F&B in 2014. Malaysia’s external halal F&B sector is of critical importance, as F&B was Malaysia’s top halal export (RM19.5 billion) in 2015, followed by palm oil derivatives (RM11 billion) and halal ingredients (RM5 billion). Malaysia ranks first on Thomson Reuters’ Halal Travel indicator. Muslim global expenditure on travel is estimated at US$142 billion or 11 per cent of global expenditure, and is projected to rise to US$233 billion in 2020. Globally, the Muslim market for pharmaceuticals and cosmetics is valued at US$54 billion or seven per cent of global expenditure. The cumulative average growth rate (CAGR) for this sector is 6.8 per cent between 2014 and 2020. Malaysia ranks just behind Singapore and Egypt on this metric. “Halal products exposition always evokes a strong interest amongst Malaysian producers of Halal products due to the country’s leadership in this sector. Malaysia, a pioneer in the global Halal movement, will demonstrate its leadership in Halal food, beverage, Halal cosmetics and Halal pharmaceuticals products at Halal Expo Dubai this year,” Mr Shahid Bin Abu Bakar, Consul of Agriculture, Consulate General of Malaysia, said. The UAE is one of the Malaysia’s largest trading partner among the GCC countries with a total trade around Dh21.6 billion. Orange Fairs and Exhibition LLC, is organising Halal Expo – an international exposition to highlight the growth in the ethical, moral and halal and healthy living, products and services. Halal Expo Dubai is the largest and most comprehensive Business-to-Business (B2B) halal exposition in the Middle East for the US$2.3 trillion global halal industry. The event, which attracted participation from 13 countries in its previous edition and registered 3,700 trade visitors from 40 countries, expect larger trade participation where buyers and sellers of halal products and services are expected to do brisk business. Mr. Raees Ahmed, Director of Orange Fairs and Events, organiser of the Halal Expo Dubai 2017, says, “We are extremely delighted to welcome the Malaysia Pavilion at the Halal Expo. Halal expositions are incomplete without Malaysia’s participation. Halal Expo Dubai focuses on a number of business verticals, including, halal food, halal beverage, halal fashion, halal cosmetics and personal care products, halal travel and tourism, halal hospitality, halal banking and finance. 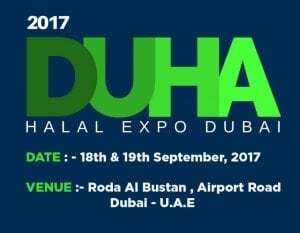 Halal Expo Dubai, supported by Dubai Islamic Economy Development Centre (DIEDC), will be open to business visitors for sourcing products and services from 10:00 to 18:00 hours, September 18 and 19, 2017 at the Roda Al Bustan Hotel – near Dubai International Airport, Al Garhoud Area. More than 100 companies from 15 countries Kazakhstan, Malaysia, Indonesia, Poland, Pakistan, Switzerland, India, UK , Brunei, Philippines, South Africa, China and many more are expected to join the show. « UK: Speciality & Fine Food Fair 2017 – The Final Countdown!